Kailey Lawrence sits with three children, Gifty, Angela and Presca outside of Children of Blessing Trust, a school owned by Lawrence's aunt in Malawi, Africa. The school is designed for children with disabilities whose parents can't care for them. Kailey Lawrence spent the last two months with little clean water, unreliable electricity, no medication and children having children — and she loved every minute of it. 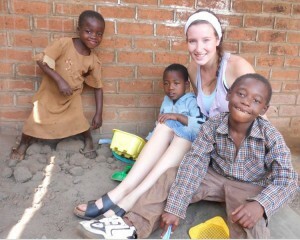 After taking a physiotherapy and occupational therapy course at Kingston Learning Center College in Kingston, she worked at the school her aunt owns in Malawi, Africa. Children of Blessing Trust is a school for kids in Africa with learning, mental and physical disabilities. “You have the ability to change their lives in the simplest way because they’re used to having nothing,” she said. “What I did there was physiotherapy. I practiced physiotherapy and occupational therapy and I was able to do it way more than I would ever be able to here. Hands on, I was an occupational therapist teacher over there,” Lawrence said. She said her favourite part was working with the kids and it was a challenge to see them so sick. She said she and her friend Lindsay Taillefer, who went to Africa with her, left the majority of their clothes in Africa with kids who didn’t have good clothes or shoes. “The children were happy but it was the parents who were extremely grateful and they were in tears of joy because of something as simple as a t-shirt,” she said. One of the biggest culture shocks next to major poverty, a lack of electricity and a shortage of medicine, Lawrence said she noticed there were no landfills. She also said the locals burn the grass just before a drought. Lawrence said there were ‘a million’ stories that struck an emotional chord for her. She told a few stories of people she met in Africa— families that had this particular effect on her. She mentioned one woman, Miriam, whose second-youngest son caught malaria at age four. “It left him with literally nothing- he can’t walk, can’t talk or do anything. And the father blamed the mom and said that God was punishing her for cheating on her husband,” Lawrence said. She said it is the norm for a father to blame a child’s disability on the mother. “Most of the children I saw were cases of malaria, but they weren’t given medication and they were left with all these disabilities. It’s sad because it is preventable, and it’s just a lack of money,” she said. Lawrence said she gave some money to a woman — approximately $3 Canadian. “I gave her the money to go to the hospital to get medicine. I’ve never seen someone so grateful for something so small,” she said. Lawrence said one thing that was hard to come to terms with was seeing children with babies. She told the story of a young girl, only 13 years old, who became pregnant after she was raped. Lawrence said they took the baby to the crisis nursery, an orphanage for children whose parents can’t care for them. Lawrence said it cost about $2,000 to fly to Malawi, and about $200 monthly to live there. She said she probably spent another $1000 in other expenses, such as donations. Most of the money was donated to her from friends and family, but she said she saved some too.